Hamster Boy: Where Does the Time Go? I don't know what it is about this time year, but I always feel this air of anticipation right around now. Perhaps it is that the second half of the year contains so many holidays (let's face it, Thanksgiving, Halloween & Christmas are biggies) and people are just generally cheerier, or it's that with the turning of the leaves and the air growing colder, it marks the beginning of the end of the year and there's that chance that the following year will bring bigger and better things. For me, I know that Autumn is truly my favorite time of year. Sure, Mother Nature often disappoints me with an overabundance of rain, but there is nothing parallel to walking through the colourful fallen leaves while the Fall sun warms your face and your breath comes out in whisps of mist that float away. But I wax poetic.... I think the only thing that comes even close is a nighttime snowfall - but we'll see if that happens here and I'll blog about that then. November has always been my favorite month and now it has extra special meaning with a child born in it. (I tried so hard to have her on the 11th, because I thought 11-11-02 would be the coolest birthdate, but we had to let someone else have that one - she was born right on the day we expected her - the 19th. Of course, November 11th is Remembrance Day here in Canada, so it's not exactly a cheerful day either.) So I am excited that October is drawing to a close and November is just on the horizon. Also, the first day of November is the first day of the National Novel Writing Month, which I am going to attempt to do. Don't hold your breath though, I am the Queen of Quitting. No promises, enough said. I have continued to struggle with this wacky cold/cough thing that seems to have held me in its clutches for about four weeks now. The first couple of weeks were pretty minor - sniffles and a slightly sore throat. Last week, I spent most of my time on the couch being totally unmotivated and coughing up indescribable things. I wasn't even knitting, so you KNOW I wasn't well!! You'd think a week of that would be enough, but being asthmatic just adds that extra element of mystery to any illness and today when I got up, I coughed for about an hour and felt like I couldn't breathe, even with my rescue inhaler. I wish coughing would make you lose weight. Hayden continues to venture further and further with his walking and even though he really only gets about four or five good steps in, he remains undaunted. His smile of victory is very gratifying. I am so glad that I have kept this blog during the first years of his life, so that he can see what a triumph it is for him to be walking and moving like everybody else in the world! I got a really pretty trinket in the mail the other day that I wanted to share with you. I ordered it a few weeks ago and had it specially made to suit my needs. 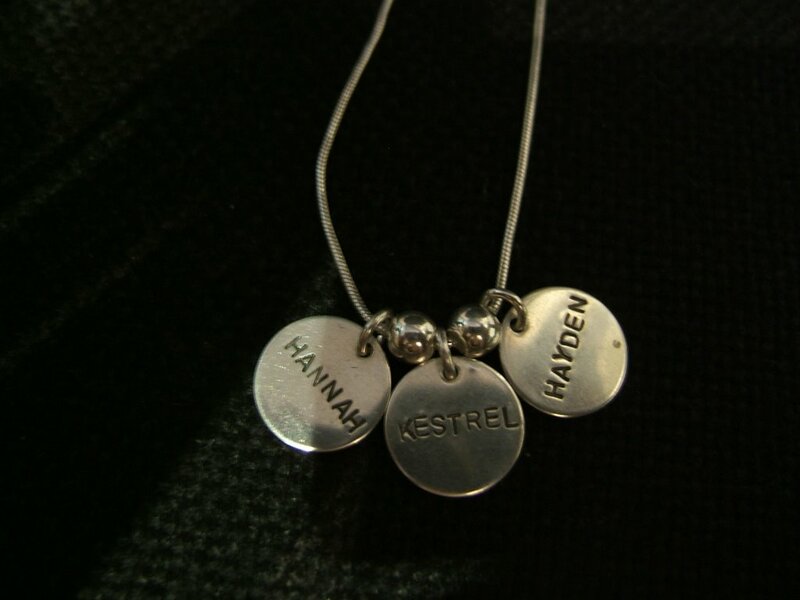 It was hard to get a picture of it, but I think between Hannah and myself, we managed. At least, I wanted you to be able to read it, so I think it worked. Cute, eh? It's from an online store called Heart on Your Wrist. It was hard to choose from the variety of options they have there, but I managed and I am very happy with it. The discs are sterling silver as is the chain. I wish I had ordered the longer chain though, as this one seems too short to me - but that can always be changed, right? 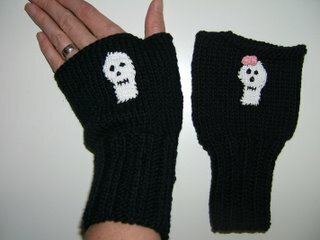 Fingerless gloves with little skullies on them! I had fun making them and I hope they keep Joan warm and snuggly! 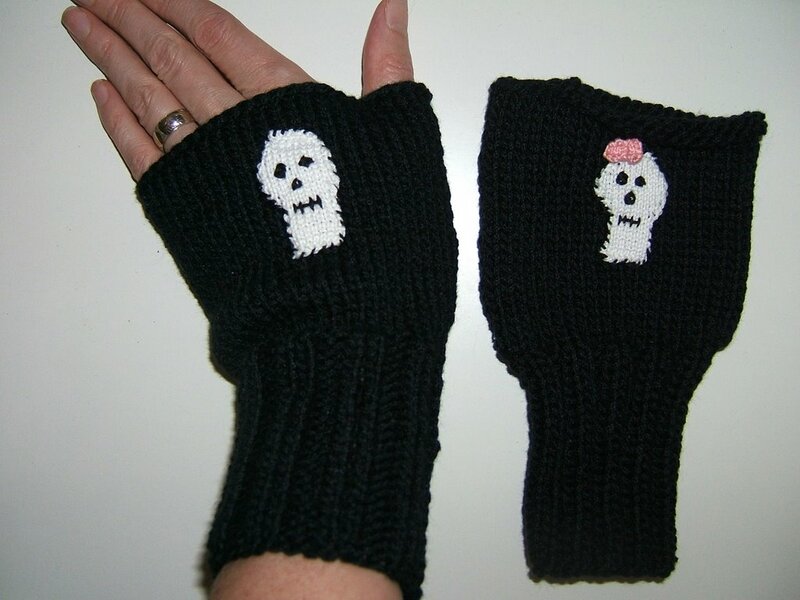 Posted by Heather at 3:49 p.m.
Those fingerless gloves are da bomb!!! Just wait until you get your THANK YOU letter! I must to be working on that this weekend!!! !